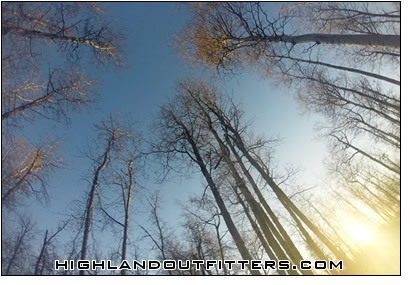 When hunting Saskatchewan in the spring, temperatures can range from 32F to 70F (OC to 22C). This time of year anything is possible in terms of the weather so pack your gear accordingly varying from cold weather, to warm weather, to rainy weather. Your hands and feet are the most susceptible to cold, wet spring weather. Be sure to pack warm, waterproof boots that are comfortable to wear for eight hours. To ensure your hands are warm, also bring warm waterproof gloves. Your hands and feet are the most susceptible to cold. Bring plenty of hand and foot warmers (Hot Shots). Layering your socks is also important. Start with a thin moisture wicking synthetic (polypropylene) sock underneath a heavier wool sock. Make sure they aren’t too tight so you have plenty of circulation for your feet. There are two options for your hands being mitts or a hand muff. Large mitts big enough to allow for chemical hand warmers as well as a thin pair of gloves are the first option. A hand muff worn around the waist with a couple of hand warmers inside, along with a thin pair of gloves is also a good way to go. Any hat used for hunting must be solid red, yellow, or orange. This is Saskatchewan law. We recommend a wool stocking cap (toque) that covers the ears with or with out a face mask. For ultimate coverage, try a thin balaclava underneath your wool cap. A “waist up” outer layer of solid white, yellow, red, or orange, large enough to fit over your bulky clothes, is required by Saskatchewan law. White is less noticeable to the bear and makes for better field photos as the antlers will show up better.